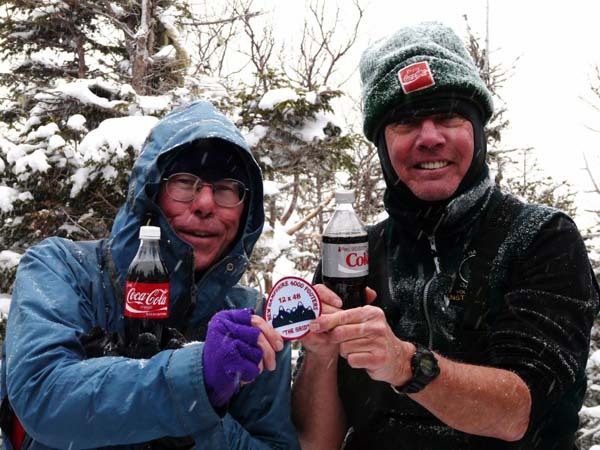 Peter completed the Grid on December 31, 2009 on Mount Jefferson. His companions for the day were Ed Hawkins, (Finisher #2), Sue Rose, Jeff Cohen, Paul Segal, Becca Munroe, John Gutowski, June Rogier, Barbara Crane, Steve Moore, Ed Smith, Tim Lucia, and Denise Penn. To view Peter's Grid click here. Below, Ed Hawkins presents Peter with his Grid patch. Why are there trees in the background? Although Ed gave Peter his patch on the summit a picture was not taken. Later during the day, the moment was reenacted on the Jewell Trail.